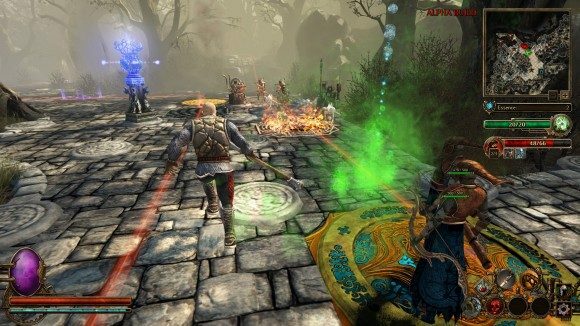 Neocore Games, whose credits include The Incredible Adventures of Van Helsing and King Arthur, have announced that their newest effort, the tower defense-action rpg hybrid Deathtrap, will be arriving on Steam via Early Access this October 22. Beneath that blood-stained edifice is a tower defense game with a surprising amount of player choice and community input. Players take control of one of three different classes, a mercenary, sorceress and marksman (aka warrior, mage, rogue), through which they can combat enemies personally whilst overseeing the machinations of their elaborate deathtraps. Players can level up a hundred times, with over 50 skills per class to choose from and a customizable inventory. Combat will yield a variety of loot, some of which can be used to craft artifacts that give weapons a tremendous boost. Deathtrap also comes packaged with a Map and Monster editor, allowing for a seemingly endless stream of user-generated content to keep the game alive long after its release. There are three game modes to choose from, the standard single player experience, a cooperative mode which comes with its own set of specially designed maps, and an adversarial multiplayer mode in which one player sets traps and fends off attackers like normal, while the other player is free to take control of any of the invading monsters and give the bad guys a serious human factor boost. Neocore are using the game’s Early Access status to garner valuable feedback from the community before an releasing it in early 2015. There won’t be a special discount for Early Access purchasers, as Neocore only want people with a genuine interest in aiding Deathtrap‘s development, and not people looking for an excuse to buy the game cheaply.